A daypack is one of the most versatile types of backpacks, so you should expect to use your new daypack quite often. It's therefore super important that you choose a daypack that is comfortable and that suits your needs. You need to make sure the backpack is big enough for the stuff you need to carry, and at the same time it cannot be too heavy. You also need to make sure the quality is good enough and that the backpack doesn't have features you don't really need. Having checked thousands of daypack reviews, we can say that the Ethnotek Raja is the best choice for most people. The Ethnotek Raja got a rating of 4.80 out of 5, while the average rating in the list below is just 4.12. Based on 60,847 reviews, this is the best reviewed daypack. Below is the list of all top 93 best daypacks. Great if the Ethnotek Raja above isn't your style. PS: We have checked 60,847 reviews to make this top 93 list! We have checked 60,847 Daypack reviews, so we can show you the weighted average rating of all the bags. A daypack is the best carrying solution when you are only planning on being outdoors for a couple of hours or more. This is probably one of the most popular type of packs, however, so you are going to find yourself bombarded with various options. So, with all of these models, features, and designs, how do you figure out what you need? Luckily for you, there are some strategies you can use to separate the great from the weak. In this article, you will be able to figure out how to grade each pack and then decide what the right one is for you. Happy Choosing! There are three things to think about when looking for daypacks for hiking. These are space, comfort, and the number of compartments. For most day hikes, you aren’t going to need much more than food, water, a layer of clothing, and perhaps a first aid kit. However, it is a good idea if all of the items aren’t placed in one compartment. Having numerous pockets, especially on the outside will make it easier for you to reach various items without having to stop. These type of daypacks also need to be comfortable to carry on your shoulders and be able to stabilize weight well. When running, you want to carry as little as possible with you, so these daypacks should be on the smaller side. However, lots of compartments on the outside are quite important. This is especially for those that are used to store hydration bladders or water bottles. These type of daypacks need to have straps that can pin it to your body. This way, there will be limited movement when you are running. When it comes to climbing, the size of the daypack is really up to you. For instance, some climbers prefer smaller packs as they are easier to move around with. Other climbers, however, carry a lot of gear with them. Due to this, they prefer larger daypacks that has a stabilizing framework. One thing you should undoubtedly look for such daypacks is plenty of loops and chains. This will allow you to fix and your gear that you may need to the outside of the pack so it can be reached quite easily. Also, a narrower profile will make it easier for you to move your shoulders and arms as you climb. Usually, cyclists prefer small daypacks that fit tightly against their backs. This prevents any excessive movement while cycling and prevents any wind resistance as well. Mountain bikers, on the other hand, may choose larger packs. This lets them carry their tools and gear with them. To make things easier, daypacks for cycling and mountain biking should have hydration packs so that you don’t have to stop to drink water. They should also have a low profile hip belt so that there is no discomfort as you peddle. The main focus of these daypacks is to have little restriction and to move as little as possible. This means that they are often smaller and narrower. They also come equipped with sternum and hip belts so that they can be secured tightly to your body. You should look for daypacks that will allow you to fasten your gear or snowshoes to the pack. Daypacks aren’t just for sports and outdoor activities, they can also be used just to travel around, perhaps to and from school. Here, the size is largely up to how you need to carry on a daily basis. What is important, though, is how many organizational features there are. For instance, you may require lots of compartments, both large and small to store various items. Also, students can find laptop compartments quite handy too. Since you will be travelling with them quite often, the straps will also need to be comfortable. 10 – 20 liters: daypacks of this size are able to store some food, water, gear, and perhaps even an extra item of clothing. These are a good fit for climbers, mountain bikers, or perhaps really short hikes. 20 – 30 liters: daypacks between these sizes are what is best for most day hikes. This will allow you to carry all of the food and water you will need. There is often enough room for some clothing items. 30 – 50 liters: if you want to carry a good amount of gear with you in addition to the water and food, this is a good sized daypack. It is also adequate for extra layers of clothes as well. To ensure that the daypack fits on your back properly and that your gait is not hindered, you need the length of your torso and that of the daypack to be similar. If you are buying online, this means that you will need to compare measurements. Consider the length between the base of your neck and just above your hip bones against the pack length. If you are making the purchase in-store, try the pack on. There should be no gap where the bag meets your shoulders. If there is one, it means the pack is too large. On the other hand, if the straps connect to the pack only just under your arms, it is too short. The pack should sit just above your hip bones so that it won’t get in the way of your walking. The hip belt will right above your hip bones and is responsible for carrying most of the weight of the bag. This means that you will need to check that once the strap is adjusted that it sits snugly around your waist. This is the best way to take the pressure off your shoulders. The sternum strap will help to balance out the weight too, especially when carrying heavier loads. It also aids in stabilizing the bag by pinning it to your chest. Make certain that it is a close fit and not too loose. In certain instances, a woman specific bag can actually be quite useful. These are designed to cater to shorter individuals who have wider hips. The sternum strap is also made to sit higher up to accommodate a larger bust. 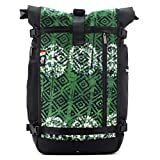 If you, as a woman, are finding it difficult to find traditional daypacks that fit, you may want to consider the more tailored packs. If you are going to be engaged in strenuous activities, there is one thing that you can be certain of: sweat. When you are carrying a load on your back, you can feel even more uncomfortable. If you are anticipating a good workout, you should look for mesh back panels. The mesh ensures that the perspiration is not absorbed and instead lets the material dry faster. What the panels really do, though, is create space between the bag and your back. This way, cool air is allowed to pass through this space, keeping your back cool. The other question is just how much access do you want to your daypack throughout your excursion? Most daypacks have what is known as a top loading design. This means that most of your belongings will be placed inside one compartment. The items that you will need later on go at the bottom of the pile while those that should be readily available go on top. These packs are known for their lightweight and simple design. If you are looking for a bit more organization, then you should look into the front loading or panel access. These contain a main compartment and then oftentimes smaller pockets. This way, you can access the bag panel by panel which makes it easier to find what you need. These additional features can sometimes result in a lighter weight for the pack. Since you are only going to use this pack for short periods of time, it is unlikely that you will require a pack that is waterproof. Instead, one that has water resistance features should be more than adequate. PU coated nylon is usually a good choice if you are expecting a little bit of rain or want to protect your belongings from moisture. There are some daypacks that come with their own rain cover which is made from water resistant materials. These are all of the features and elements that you should take into consideration when choosing your daypack. This will make it much more likely that you will buy a pack that will serve you and your lifestyle well. Classic daypacks and models that haven't yet got enough reviews to be ranked. List ID 3. Images from Amazon Product Advertising API and shop datafeeds.